Immigration has shaped the United States as a nation since the first newcomers arrived over 400 years ago. Beyond being a powerful demographic force responsible for how the country and its population became what they are today, immigration has contributed deeply to many of the economic, social, and political processes that are foundational to the United States as a nation. Although immigration has occurred throughout American history, large-scale immigration has occurred during just four peak periods: the peopling of the original colonies, westward expansion during the middle of the 19th century, and the rise of cities at the turn of the 20th century. The fourth peak period began in the 1970s and continues today. These peak immigration periods have coincided with fundamental transformations of the American economy. The first saw the dawn of European settlement in the Americas. The second allowed the young United States to transition from a colonial to an agricultural economy. The industrial revolution gave rise to a manufacturing economy during the third peak period, propelling America's rise to become the leading power in the world. Today's large-scale immigration has coincided with globalization and the last stages of transformation from a manufacturing to a 21st century knowledge-based economy. As before, immigration has been prompted by economic transformation, just as it is helping the United States adapt to new economic realities. For a nation of immigrants and immigration, the United States adjusts its immigration policies only rarely, largely because the politics surrounding immigration can be deeply divisive. As a result, immigration policy has often been increasingly disconnected from the economic and social forces that drive immigration. When changes have been made, they have generally taken years to legislate. Today, the United States may be on the threshold of major new reforms that would address longstanding problems of illegal immigration, as well as those in the legal immigration system, which has not been updated since 1990. The impetus for comprehensive immigration reform (CIR) has returned to the congressional stage, with bipartisan groups in the House and Senate engaged in significant negotiations to craft legislation that would increase enforcement at the nation's borders and interiors, legalize the nation’s estimated 11 million unauthorized immigrants, and provide legal avenues for employers in the United States to access future workers they need. CIR, in one form or another, has been under consideration since at least 2001, with major debates in the Senate in 2006 and 2007. After the failure of CIR legislation in the Senate in 2007, the effort to reform the nation's immigration laws was sidelined. The results and voting patterns of the 2012 presidential election gave both political parties new reasons to revisit an immigration reform agenda. This country profile examines key legislative events that form the history of the U.S. immigration system, the size and attributes of the immigrant population in the country, the characteristics of legal and illegal immigration streams, U.S. policies for refugees and asylum seekers, immigrant integration efforts, postrecession immigration trends, immigration enforcement, immigration policies during President Obama's administration, and prospects for reform legislation. In the decades prior to 1880, immigration to the United States was primarily European, driven by forces such as industrialization in Western Europe and the Irish potato famine. The expanding frontiers of the American West and the United States' industrial revolution drew immigrants to U.S. shores. Chinese immigrants began to arrive in large numbers for the first time in the 1850s after gold was discovered in California in 1848. Federal oversight of immigration began in 1882, when Congress passed the Immigration Act. It established the collection of a fee from each noncitizen arriving at a U.S. port to be used by the Treasury Department to regulate immigration. Arriving immigrants were screened for the first time under this act, and entry by anyone deemed a "convict, lunatic, idiot, or person unable to take care of himself or herself without becoming a public charge" was prohibited. As the mining boom in the West began to subside, animosity toward the large populations of Chinese laborers and other foreigners surged, and so began a series of legislative measures to restrict immigration of certain racial groups, beginning with nationals of China. The Chinese Exclusion Act of 1882 was the first such law. It halted immigration of Chinese laborers for ten years, barred Chinese naturalization, and provided for the deportation of Chinese in the country illegally. In a follow-on bill, Congress passed the 1888 Scott Act and banned the return of Chinese nationals with lawful status in the United States if they departed the country. In 1892, the Geary Act extended the ten-year bar on Chinese labor immigration, and established restrictive policies toward Chinese immigrants with and without legal status. Between 1880 and 1930, over 27 million new immigrants arrived, mainly from Italy, Germany, Eastern Europe, Russia, Britain, Canada, Ireland, and Sweden. This peak immigration period—the last large-scale immigration wave prior to the current period—also led to new restrictions. In an expansion of racial exclusion, and by overriding a presidential veto, Congress passed the 1917 Immigration Act which prohibited immigration from a newly drawn "Asiatic barred zone" covering British India, most of Southeast Asia, and nearly all of the Middle East. It also expanded inadmissibility grounds to include anarchists, persons previously deported within the past year, and illiterate individuals over the age of 16. Nativist and restrictionist sentiment continued through the 1920s, prompting the United States to introduce numerical limitations on immigration for the first time. The Immigration and Naturalization Act of 1924 established the national-origins quota system, which set a ceiling on the number of immigrants that could be admitted to the United States from each country. It strongly favored northern and western European immigration. The 1952 Immigration and Nationality Act continued the national-origins quota system but for the first time allocated an immigration quota for Asian countries. Although the discriminatory nature of the national-origins quota system had become increasingly discredited, it took until the Kennedy era and the ripple effects of the nation's civil-rights movement for a new philosophy guiding immigration to take hold. The resulting Immigration and Nationality Act Amendments of 1965 repealed the national-origins quota system and replaced it with a seven-category preference system based primarily on family unification. Overall, the legislation set in motion powerful forces that are still shaping the United States today. The 1965 act increased numerical limits on immigration from 154,000 to 290,000. A ceiling on immigration from the Americas (120,000) was imposed for the first time, and a per-country limit of 20,000 was set for Eastern Europe. The new caps did not include "immediate family members" of U.S. citizens (spouses, minor children, and parents). In 1976, the 20,000 per county limit was applied to the Western Hemisphere. The year before the 1965 Act, Congress terminated the Bracero program, which it had authorized during World War II to recruit agricultural workers from Mexico to fill farm-labor shortages in the United States. In the wake of these and other sweeping changes in the global economy, immigration flows that had been European-dominated for most of the nation's history gave way to predominantly Latin American and Asian immigration. Today's large-scale immigration began in the 1970s, and has been made up of both legal and illegal flows. Prior periods of large-scale immigration occurred before visas were subject to numerical ceilings, so the phenomenon of "illegal immigration" is a relatively recent element of immigration policy history and debates. The largest source country of legal admissions, Mexico, has also accounted for the largest share of illegal immigrants who cross the southwest land border with the United States to seek the comparatively higher wages available from U.S. jobs. Legalization that granted legal status to unauthorized immigrants who had lived in the United States for at least five years (with a more lenient measure for agricultural workers) in an effort to "wipe the slate clean" of illegal immigration for the future. The combined programs granted lawful status to 2.7 million individuals (out of 3 million applicants). Ultimately, IRCA failed for several reasons. First, the legalization program excluded a significant slice of the unauthorized population that had arrived after the five-year cutoff date but stayed in the United States and became the core of a new unauthorized population. Second, improvements in border enforcement did not begin in earnest until the 1990s. And the heart of the law—employer sanctions—had weak enforcement provisions that proved ineffective at checking hiring practices of sizable numbers of unauthorized immigrants. Four years later, Congress passed the Immigration Act of 1990 to revamp the legal immigration system and admit a greater share of highly-skilled and educated immigrants. It raised legal immigration caps, modified the temporary nonimmigrant visa system, and revised the grounds of inadmissibility and deportation. The law also established Temporary Protected Status (TPS), creating a statutory footing for permission to live and work in the United States to nationals of countries deemed unsafe for return because of armed conflict or natural disaster. Overall, IRCA and its enforcement mechanisms were no match for the powerful forces that drive illegal migration. Both IRCA and the 1990 Act failed to adequately foresee and incorporate measures to provide and manage continued flows of temporary and permanent immigrants to meet the country's labor market needs, especially during the economic boom years of the 1990s. The Personal Responsibility and Work Opportunity Reconciliation Act (PRWORA), commonly known as the Welfare Reform Act, denied access to federal public benefits, such as Medicaid, Supplemental Security Income (SSI), and food stamps to categories of authorized and unauthorized immigrants. Some states later chose to reinstate some of these benefits for authorized immigrants who lost eligibility under PRWORA. The Illegal Immigration Reform and Immigrant Responsibility Act (IIRIRA) bolstered immigration enforcement, increased penalties for immigration-related crimes, provided for expedited removal of inadmissible noncitizens, barred unlawfully present immigrants from re-entry for long periods of time, and set income requirements for immigrants' family sponsors at 125 percent of the federal poverty level. IIRIRA also required the government to track foreign visitors' entries and exits, which became a key element in the government's security strategy after the 9/11 terrorist attacks. Subsequently, Congress returned to shoring up legal immigration measures in 2000 by enacting the American Competitiveness in the Twenty-First Century Act to meet demand for skilled immigrants—especially in science, math, and engineering specialties—and enable employers to fill technology jobs that are a critical dimension of the post-industrial, information age economy. The act raised the annual number of H-1B visas given to high-skilled workers in specialty occupations to 115,000 in fiscal year (FY) 2000, then to 195,000 for FY 2001, 2002, and 2003. At present, 65,000 H-1B visas per year are available, with an additional 20,000 H-1B visas (due to a law passed in late 2004) for foreign-born individuals with advanced U.S. degrees. The 1990s saw the longest period of sustained economic and job growth the United States had experienced since at least World War II. Immigration—at both high and low ends of the labor market, both legal and illegal—was an important element in achieving the productivity and prosperity of the decade. Immigration also contributed to the economic transformation required for the United States to compete in a global economy. With more than 14 million newcomers (legal and illegal), the 1990s reached numerical levels that out-numbered the previous all-time high set during the first decade of the 20th century. The trend has continued into the 2000s with more than 16 million newcomers from 2000-10. No recent event has influenced the thinking and actions of the American public and its leaders as much as the terrorist attacks of September 11, 2001. In the almost-12 years since 9/11, many aspects of the U.S. immigration enforcement system have become dramatically more robust. The national security threat posed by international terrorism led to the largest reorganization of the federal government since World War II. The overhaul brought about the merger of 22 federal agencies to create the Department of Homeland Security (DHS) in 2003. U.S. Citizenship and Immigration Services (USCIS) adjudicates immigrant benefit applications, such as visa petitions, naturalization applications, and asylum and refugee requests, and administers the E-Verify program. An additional new post-9/11 immigration entity has been US-VISIT, which is housed in the National Protection and Programs Directorate (NPPD) of DHS. It manages the IDENT biometric fingerprint information system used by all immigration agencies—including consulates abroad in visa screening—to confirm the identity of noncitizens entering the country. 9/11 also led to the passage of a series of new national security laws with far-reaching implications for noncitizens seeking to travel to or living in the United States. The most well-known is the USA Patriot Act. With regard to immigration, the act expanded the authority of law enforcement agencies to search, monitor, detain, and remove suspected terrorists, and allowed for the detention of foreign nationals for up to seven days before the government files criminal or immigration charges. It also strengthened border enforcement, especially along the northern border with Canada. Laws that followed include the Enhanced Border Security and Visa Entry Reform Act of 2002 (EBSVERA), which tightened visa screening, border inspections, and tracking of foreign-born persons, including foreign students, particularly through broad use of biometric fingerprint records. It also served as an impetus to create the US-VISIT program, as the bill mandated information-sharing systems that made national security data available to immigration officers responsible for issuing visas, making removal or admissions decisions, and for investigations and identification of noncitizens. In June 2002, the U.S. Attorney General began the National Security Entry-Exit Registration System (NSEERS), a program that placed extra travel screening requirements on nationals from a list of 25 countries associated with an Al Qaeda presence (and North Korea). Additionally, males over the age of 16 who were nationals of designated NSEERS countries and already living in the United States were required to register with the federal government and appear for "special registration" interviews with immigration officials. The program was discontinued in 2011. In 2005, the REAL ID Act prohibited states from issuing driver's licenses to unauthorized individuals, and expanded terrorism-related grounds of inadmissibility, removal, and ineligibility for asylum. One year later, the Secure Fence Act of 2006 authorized the completion of 700 miles of fencing along the southwest border with Mexico. Heightened security and data-sharing measures adopted after the attacks has enabled the government to meet a post-9/11 goal of "pushing the border out." By screening individuals seeking to enter the United States more times and against more databases than ever before, those who pose a threat to the country can be prevented from ever reaching U.S. soil, often times before they even board a plane. This objective is being bolstered by increased collaboration with foreign governments in law enforcement matters and through international agreements that allow bilateral sharing of information such as Passenger Name Records (PNRs). One immediate result of tightened screening procedures was a dramatic drop in the number of visas the government issued to individuals wishing to visit, work, and live in the United States. Between 2001 and 2002, the number of nonimmigrant visas fell by 24 percent. Present visa issuances have returned to pre-9/11 levels, but it has taken ten years to rebound. The U.S. foreign-born population (legal and illegal) is 40.4 million, or 13 percent of the total U.S. population of 311.6 million, according to 2011 American Community Survey estimates. Although this is a numerical high historically, the foreign born make up a smaller percentage of the population today than in 1890 and 1910 when the immigrant share of the population peaked at 15 percent. The foreign-born share fell to a low of 5 percent (9.6 million) in 1970. About 20 percent of all international migrants reside in the United States, which, as a country, accounts for less than 5 percent of the world's population. The foreign-born population is comprised of approximately 42 percent naturalized citizens, 31 percent permanent residents (green card holders), and 27 percent unauthorized immigrants. Roughly 11.7 million, or 29 percent of the immigrant population is from Mexico, the largest immigration source country. Chinese and Indian immigrants make up the second and third largest immigrant groups, with 1.9 million or 5 percent of the foreign-born population each. In 2010, India replaced the Philippines as the third largest source country (see Table 1). 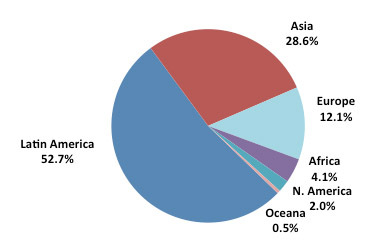 The top three regions of origin of the foreign-born population are Latin America, Asia, and Europe (see Figure 1). Source: MPI Data Hub, available online. The foreign-born population is geographically concentrated, with 65 percent residing in the six states that have long been the country's main immigrant destinations—about 25 percent in California alone (in 2011). The other immigrant-heavy states are New York (11 percent of all foreign born), Texas (10 percent), Florida (9 percent), Illinois (4 percent), and New Jersey (5 percent). The proximity of several of these states to Mexico and longstanding, continuous immigration to traditional metropolitan destinations in New York, New Jersey, and Illinois created strong networks that have grown over time. While these states continue to draw and represent the bulk of the foreign-born population, newcomers—particularly unauthorized immigrants from Mexico—began to settle in many additional destinations during the 1990s. Employment opportunities—particularly in agriculture, food manufacturing and construction—mainly fueled the new settlement patterns. They combined with lower costs of living and "hollowing out", i.e. depopulation of certain areas of the country due to aging and internal migration. As a result, states like Georgia, Nevada, and many others have become known as the "new growth" or "new destination" immigration states. Ten states, mostly in the south and west, have experienced over 270 percent immigrant population growth since 1990. They are North Carolina, Georgia, Tennessee, Arkansas, Nevada, South Carolina, Kentucky, Nebraska, Utah, and Alabama. These changes and patterns help to explain why immigration has become an issue of national political concern and debate. The guiding principles, and different ways to immigrate to the United States were largely established by the 1965 Immigration and Nationality Act and take place through three primary immigration streams. They are family (re)unification for U.S. citizens and lawful permanent residents (LPRs or "green card" holders) with close family members; meeting legitimate labor market needs; and refuge for those in need of humanitarian protection (see next section). The most common ways to immigrate are through the family-based or employment-based channels. Family-based immigration rests on the principle of family unity. Immediate family members of U.S. citizens—defined as their spouses, minor children, and parents—can join their U.S. families without numerical limitations. U.S. citizens can also (re)unify with their adult married and unmarried children, as well as with their siblings, but the waiting times for such (re)unifications are lengthy, as is the case with family reunification for most LPRs. Family-based immigrants must be sponsored by a qualifying relative under any of six categories of relatives. Family-sponsored immigration has accounted for about two-thirds of all permanent immigration to the United States over the last decade. Employment-based visas for permanent immigration are dedicated to the nation's economic and labor market needs. Employment-based immigration is limited to 140,000 visas per year, and has accounted for between 12 percent (in 2003) and 22 percent (in 2005) of legal immigration in the last decade. In FY2011, it was 13 percent. Employment-based green cards are available for five categories of workers, the majority of whom must be sponsored by their employer. * At least 77 percent of the total visas available to the 2nd Family Preference (2A and 2B) must be allocated within the 2A category. ** Under the Immigration and Nationality Act (INA) 203(b), the statutory caps for the employment-based categories are listed as percentages of the worldwide level of employment-based visas. Table 1 calculates the actual number of visas allocated in each category in accordance with the current 140,000 annual “floor” of employment-based visas. ++ The Nicaraguan and Central American Relief Act (NACARA), Pub. L. 105-100 (November 19, 1997), further limited the number of visas that may be issued in the 3rd preference “other” category, by allowing a reduction of up to 5,000 of the 10,000 visas allocated to this category to offset visas issued to NACARA beneficiaries. Source: Immigration and Nationality Act (INA) 201, 203, 204. Additionally, each year, approximately 50,000 individuals are granted permanent residency through the diversity visa lottery. Under the Immigration Act of 1990, 55,000 applicants from countries that are underrepresented in U.S. immigration streams are granted immigrant visas each year (5,000 are reserved for applicants under the Nicaraguan and Central American Relief Act [NACARA] of 1997). Noncitizens must qualify for a family-based or employment-based visa, be a refugee or asylee, or be selected in the diversity visa lottery in order to become LPRs, i.e. immigrants. LPRs can permanently live and work in the United States, are eligible to naturalize after a certain number of years, and are subject to removal if they commit a serious crime. With the exception of spouses, minor children, and parents of U.S. citizens, the number of individuals who can become permanent residents each year is limited in statute by numerical ceilings and per-country limits. However, the demand to immigrate greatly exceeds the number of visas Congress authorizes the government to grant. Additionally, no more than 7 percent of immigrant visas can be issued to nationals of a single country. The result has been delays in granting applications for eligible green card petitioners that frequently span many years, especially for immediate family members from Mexico or the Philippines, for example, which are among the top five source countries for legal immigration but face severe delays in getting a green card. Over the past 150 years, the levels of legal immigration have varied, from over 1 million people per year during the early 20th century to a trickle during the Great Depression and World War II (see Figure 2). Immigrants legalized under IRCA caused the number of authorized immigrants to peak in the late 1980s. The 1990s and 2000s, until the recession, have registered historic highs in overall immigration levels. Note: The 1990 spike in LPR admissions reflects the one-time adjustment of newly legalized immigrants under IRCA. Source: Department of Homeland Security, Office of Immigration Statistics, Yearbook of Immigration Statistics (various years). Available online. The United States has long been the world's leading country of refuge, providing protection to victims of political, ethnic, religious and other forms of persecution through asylum and refugee resettlement. Humanitarian protection has been an abiding, albeit sometimes controversial, tenet of U.S. immigration policy. The statutory determination to qualify as a refugee or asylee is the same. However, the terminology differs: refugees are granted humanitarian relief in a foreign country and travel to the United States for resettlement, while asylees apply for humanitarian status having already reached or are living in the country. Refugee policy includes a flexible ceiling on admissions that the president and Congress set each year. Slots are allotted regionally to refugees from East Asia, Near East/South Asia, Africa, Europe/Central Asia, and Latin America and the Caribbean. Admissions may also be made from an "unallocated reserve." The United States admitted large numbers of refugees after World War II, in response to migration waves that occurred in the war's aftermath and in accord with international refugee protocols adopted by the United Nations. In 1980, Congress passed the Refugee Act, a measure that adopted the definition of a refugee in U.S. refugee law with international standards. It established, for the first time, a permanent and systematic procedure for admitting refugees, created a formal refugee resettlement process, and provided a statutory base for asylum for the first time. Beginning that same year and throughout the 1980s, U.S. refugee and asylum laws became the subject of considerable controversy, when massive numbers of Central Americans from Guatemala, El Salvador, and Nicaragua began to flee civil war and repression in their home countries and apply for political asylum in the United States. Offering protection to these refugees, however, was at odds with the Reagan administration's cold war strategy of providing support to Central American governments being challenged by left-wing rebels. As a result, Salvadoran and Guatemalan asylum claims were approved at extremely low rates, while between 1981 and 1990, almost one million Salvadorans and Guatemalans are estimated to have entered the United States unlawfully. During the same period as the Cold War ended, large resettlement programs for refugees from Southeast Asia and the former Soviet Union have been replaced with admissions from a more diverse set of countries. One exception is Cuba, a communist country from which hundreds of thousands have fled since its 1959 revolution. This massive emigration led to a 1994 agreement intended to prevent Cubans from trying to reach the United States by boat under life-threatening conditions. In FY 2011, there were 36,452 new immigrants from Cuba, the vast majority entering as refugees. In the 1970s and 1980s, refugee and humanitarian emergencies led to annual admissions of more than 200,000 during some years. During the last decade and half, and especially since 9/11, both the size of the refugee program and annual asylum grants have decreased (see Figure 3). FY 2011 saw 56,384 refugee arrivals, down from 73,293 in FY 2010. Burma (16,972) Iraq (9,388) Bhutan (14,999), Somalia (3,161), and Cuba (2,920) were the top five refugee-sending countries of FY 2011. That year, 24,988 individuals were granted asylum (defensive and affirmative), a slight uptick from FY 2010 after about ten years of steady decline. There is no cap on asylum approvals. Noncitizens who enter the United States for tourism, work, or study reasons are admitted with a temporary nonimmigrant status. There are over 70 categories of visas for nonimmigrants, including tourists, business visitors, foreign students, H-1B workers, religious workers, intracompany transferees, diplomats, and representatives of international organizations. Nonimmigrant visas typically have strict terms and conditions, and allow for periods of stay ranging from a few weeks or months to six or more years. A small number of nonimmigrant visas allow for eventual permanent residency. In 2011, 7.5 million nonimmigrant visas were granted. Temporary tourism and business visitors represent the vast majority of nonimmigrant visa holders. Nonimmigrant visas issued to foreign students have increased significantly during the last decade. The 447,410 student visas issued in 2011 is more than 50 percent greater than the number issued in 2001. Much of this growth has been driven by the exponential rise in students from China, who now represent 35 percent of all foreign students. South Korea, Saudi Arabia, and India also send students to the United States in high numbers. Under the 14th amendment of the U.S. constitution, persons born on U.S. soil are American citizens. Citizenship can also be acquired through naturalization. U.S. citizens are entitled to rights and privileges not extended to noncitizens, such as the right to vote, protection from deportation, ability to apply for immigration of family members, and eligibility for federal assistance programs. 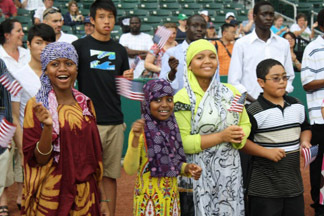 Permanent residents are eligible for U.S. citizenship once they are have lived continuously in the country for five years (three years if they are married to a U.S. citizen), are at least 18 years old, have not committed any serious crimes, have good moral character, and have knowledge of the English language and U.S. civics, demonstrated by passing a citizenship test. The current exam emphasizes U.S. history and government, and was introduced in 2008 after years of design, evaluation, and testing. The average annual number of naturalizations increased from less than 120,000 during the 1950s and 1960s to 210,000 during the 1980s, up to 500,000 during the 1990s, and again to 680,000 between 2000 and 2009. In 2012, there were 757,434 naturalizations, up from 694,193 in 2011 and 619,913 in 2010. As of FY 2011, 8.5 million LPRs were eligible to naturalize but had not applied. A combination of reasons, including inadequate language skills needed to pass the citizenship exam, fear of the exam, an expensive filing fee of $680, and lack of knowledge about the naturalization process, can all discourage potential applicants. Since the 1990s, a series of new laws and policies have affected naturalization trends. IRCA brought about historically high naturalizations in the mid-1990s as the 2.7 million unauthorized immigrants who obtained LPR status under the law's legalization program became eligible for naturalization. The growing eligibility pool further grew with passage of the 1996 laws described above. They reduced noncitizens' access to federal benefits and legal protections, thus incentivizing naturalization. Between 1994 and 1997, the number of naturalization petitions filed nearly tripled, from 543,353 to 1,412,712. Naturalization spiked again in 2008 as a result of citizenship outreach campaigns ahead of the 2008 presidential election, coupled with a scheduled increase in the naturalization application fee that many eligible applicants attempted to beat. In 2012, Mexico accounted for the highest share of naturalizations (13.7 percent), followed by the Philippines (5.9 percent), India (5.7 percent), the Dominican Republic (4.4 percent), and China (4.2 percent). The largest number of new citizens lived in California (21 percent), Florida (13.3 percent), and New York (12.4 percent), according to DHS statistics. Unauthorized immigrants enter the United States by crossing the land border clandestinely between formal ports of entry, using documents fraudulently for admission at a port of entry, or overstaying a valid temporary visa. Illegal immigration began to build and reach relatively high levels in the early 1970s. Immigration policymaking in the United States has been preoccupied with the issues it represents for much of the four decades since. The numbers of unauthorized immigrants who were not eligible for IRCA's legalization but remained in the United States, in addition to immigration spurred by rapid job creation in the 1990s and early 2000s, combined with powerful push factors in Mexico, have caused the unauthorized population to grow by 300,000 to 500,000 per year between 1990 and 2006. After reaching an estimated peak of 12 million in 2007, the unauthorized population has declined in recent years, to 11.1 million in 2011, according to the Pew Hispanic Center. Illegal immigration is a bellwether of economic conditions, growing substantially in a strong economy with high demand for low-skilled labor (the 1990s and early 2000s), and tapering off with economic contraction (since 2008) (see Figure 4). The arrival of unauthorized immigrants in large numbers has revitalized certain communities and contributes to local economic growth. At the same time, rapid and unchecked social change and pressure on public services brought about by individuals here illegally has sparked anger and resentment, making immigration a hotly contested issue of national concern. DHS estimates that 59 percent of unauthorized residents are Mexican born; with El Salvador accounting for 6 percent, Guatemala 5 percent, Honduras 3 percent, and China 2 percent. The ten leading countries of origin also include the Philippines, India, Korea, Ecuador, and Vietnam, which represented 85 percent of the unauthorized immigrant population in 2011. Roughly 46 percent of unauthorized adult immigrants are parents of young children. As of 2010, there were 5.5 million minors with at least one unauthorized parent. While 1 million of these minors are also unauthorized, the vast majority—4.5 million—are U.S.-born, and are, therefore, American citizens. While the public debate tends to focus disproportionately on questions of who, how many, and what kind of noncitizens should be admitted to the United States, many see immigrant integration as the true test of a successful immigration system. Unlike other traditional immigration countries, such as Canada and Australia, for example, the United States does not have a federally-driven immigrant integration policies or an agency responsible for making sure immigrants effectively become part of U.S. society. Instead, integration policies are limited, underfunded, largely ad hoc, and often target narrow immigrant groups, such as refugees or migrant workers. Historically, schools, churches, employers, and community-based groups have taken the lead at the local level to spearhead immigrant integration efforts that include English classes, job training, and health care clinics. In recent years, several states and cities have launched integration initiatives aimed at improving opportunities and services available to immigrants. Federal policies that affect immigrant integration outcomes include the No Child Left Behind Act passed in 2001 that required schools and funding for states to ensure that limited English proficient (LEP) children become proficient in English. In 2009, the Children's Health Insurance Program (CHIP) was expanded to cover authorized immigrant children. Additionally, the federal Adult Education program funds English education and GED preparation. Access to basic rights and mainstream institutions in American society like most jobs in the labor market, public education, community and emergency health care systems, and citizenship have been the pillars of successful integration, despite that fact that they do not represent explicit, formal policy efforts. Integration is commonly measured by comparing indicators such as income, education, health, and living standards for foreign and native-born populations. Despite the absence of broad immigrant integration policies, the foreign born have historically become well integrated in the United States. At the same time, today's large numbers of foreign born, especially the sizable unauthorized population who may gain legal status if CIR is enacted, pose substantial immigrant integration challenges for all levels of government and society—as well as for the individuals themselves—in the years ahead. As illegal immigration intensified during recent decades, immigration enforcement has been the dominant focus of the federal government's response to immigration for at least 25 years. Enforcement involves visa screening; land border enforcement between ports of entry; land, air, and sea ports of entry admissions, employer enforcement, detention and removal of criminals and others who have violated immigration laws, and immigration administrative courts. Nonetheless, the dominant focus of immigration enforcement has been the southwest land border enforcement. The U.S.-Mexico border is a diverse area that spans more than 1,900 miles. For most of the period since the Border Patrol was created in 1924, chronic lack of funding and adequate resources prevented it from carrying out its mission of preventing illegal border crossings. That began to change with stepped up border enforcement during the 1990s. Since then, the federal government has invested billions of dollars into personnel, infrastructure, and technology on the border. The Border Patrol now has more than 21,000 agents, having doubled in size since just 2005; 651 miles of border fencing has been built (mandated in the 2006 Secure Fence Act); and a vast array of cameras, ground sensors, aircraft, and drones are in place. More than $11 billion was spent on border enforcement in FY 2011. As a result, crossing points that were traditionally used by people entering illegally into the country have been largely closed off, making it difficult, dangerous, and expensive to cross. The number of apprehensions the Border Patrol makes has decreased from nearly 1.7 million in 2000 to 365,000 in 2012. Immigration enforcement capabilities in the country's interior have also been significantly strengthened. Deportations, federal partnerships with state and local law enforcement agencies, and efforts to discourage hiring of unauthorized immigrants are all parts of the equation. Since 1986, the government has carried out more than 4 million deportations (or removals). Almost half have occurred since 2007. Annual removals have climbed steeply for the last 15 years, from roughly 30,000 in 1990 to 188,500 in 2000, to over 400,000 in 2012. Deportation levels are largely governed by Congress, which provides the enforcement agencies with levels of funding that specify the numbers to be detained and removed each year. While some argue that historically high removals enhance national security, public safety, and the rule of law, others contend that the system carries severe human costs to families, children, communities, and tears at the social fabric of the United States. Immigration enforcement has been seen as the responsibility of the federal government since at least the late 1800s. However, in 1996, as part of IIRIRA, Congress created a provision called section 287 (g) which established cooperation between federal and state agencies to enforce immigration laws. This cooperation has been carried out through two widely used but controversial programs: the 287 (g) program and Secure Communities. 287 (g) deputizes state and local law enforcement officers to enforce immigration laws, and is being phased out after peak use in 2010. In its place, Secure Communities is being used in almost every jurisdiction in the country. Through the program, fingerprints taken during the arrest process are automatically checked against federal immigration records and arrestees can then be detained by ICE. These programs reflect important technological advances in identification and data sharing made in recent years, in addition to a goal of the Obama administration to focus enforcement actions on criminals. Some states, particularly those that experienced rapid immigrant population growth during the past two decades, became increasingly frustrated with what they perceived as inadequate federal enforcement of immigration laws. They began enacting their own enforcement legislation. Arizona's SB1070, which passed in 2010, was the first and best known of these measures. It required state and local police officers to inquire into the immigration status of anyone stopped or arrested if an officer has "reasonable suspicion" that the individual is an unauthorized immigrant. In 2011, five more states—Utah, Indiana, Georgia, Alabama, and South Carolina—enacted similar laws. Legal challenges to SB1070 as an unconstitutional pre-emption of federal authority moved quickly through the federal courts. In June 2012, the Supreme Court struck down all but one of the provisions of the Arizona law in a landmark decision that upheld federal primacy in immigration enforcement. Employer enforcement has been the weakest element of U.S. immigration enforcement strategy. Large-scale worksite enforcement raids, such as the one of a meatpacking plant in Postville, Iowa, in 2008 have been supplanted with a new focus by the Obama administration on auditing employers and punishing those who violate hiring laws, rather than the workers who are improperly employed. At the same time, the voluntary online E-Verify system developed by DHS to check the immigration status of new hires has gained traction. In 2009, the Obama administration mandated its use by all federal contractors. Many states have established similar requirements. By 2012, 400,000 employers were enrolled in the program compared to 24,463 five years before. In its early years, E-Verify was criticized heavily for inaccuracy. While many improvements have been made, concerns remain over the program's inability to validate identity, detect identity theft, and the possibility that its use can lead to discrimination and unfair labor practices. At nearly $18 billion in FY2012, federal spending for immigration enforcement is now 24 percent greater than spending for all other principal criminal federal law enforcement agencies combined. Public sentiment that called for strengthened enforcement as a necessary pre-condition for broader immigration reform measures has both driven the build-up and succeeded in accomplishing it. A New Era of Lower Levels of Immigration? Despite the large numbers of unauthorized immigrants residing in the United States, numerous indicators suggest that changing migration dynamics have set in that will reduce levels of illegal immigration in the future, even as the U.S. economy rebounds. After growing annually for several decades, the size of the unauthorized population has begun to decline since 2007. Furthermore, the number of migrants arrested while attempting to cross the border has fallen dramatically during the last decade, especially since 2008. The Pew Hispanic Center estimates that immigration from Mexico has reached net zero and has possibly reversed, meaning that inflows and outflows are approximately equal or outflows are greater. A combination of factors is responsible for the new trends. First, sectors that typically employ unauthorized immigrants—including construction, hospitality, and tourism—experienced deep job loss in the recession, so job demand for lower-skilled workers has diminished. Second, the buildup of immigration enforcement at the border and in the U.S. interior has raised the costs, risks, and difficulty of migrating illegally. Finally, structural changes in Mexico—sustained economic growth, improved rates of high school graduation, falling fertility rates, a decline in the size and growth of the prime working-age population, and the emergence of a strong middle class—have slowed emigration. Taken together, these changes represent significant, lasting new developments that are likely to remain in place during the near-term future. President Obama was unsuccessful in obtaining immigration reform legislation during his first term, although he identified it as among his top legislative priorities. Many immigrant voters and communities charged him with having broken a promise and not worked hard enough on the issue with Congress. At the same time, Congress has been deeply divided on immigration legislation and showed no appetite to take up the issue again after the repeated failures of 2005-2007. In the face of legislative inaction, the administration took a series of executive actions to establish new policies and initiatives that have led to important shifts in U.S. immigration policy. The most significant new policy the administration created has been the Deferred Action for Childhood Arrivals (DACA) program, which was announced in June 2012. The program grants deferred action (protection from deportation) and work authorization to certain young unauthorized immigrants who came to the United States as children, have pursued an education, and have not committed serious crimes or pose no national security threat. In a further step, DHS deemed DACA status to constitute "lawful presence," which makes individuals eligible for driver's licenses and other state-determined benefits where states choose to grant them. According to Migration Policy Institute estimates, 1.7 million individuals are eligible for the DACA program. As of March 2013, the program's rolling application process has seen 469,530 requests and USCIS has approved 245,493 cases. In July 2010, the Department of Justice brought a lawsuit against Arizona challenging the constitutionality of its immigration law SB1070. The administration also challenged immigration laws passed in Alabama, South Carolina, and Utah. In 2010, DHS announced an updated prosecutorial discretion directive. The new policy called for prioritizing certain noncitizens (serious criminals, national security threats, immigration law violators, and recent border crossers) over others for removal from the United States. The 2012 election fundamentally changed the political calculus of immigration reform. More than 12 million Latino voters went to the polls, making up 10 percent of the American electorate. Seventy-three percent of them supported President Obama, representing a crucial margin that played a key role in his re-election victory. Other smaller immigrant groups, such as Asians, also overwhelmingly supported the president's re-election. With the Latino electorate slated to grow to 28 million by 2016, both the Republican and Democratic parties have strong incentives to court Latino and other immigrant-group voters, for whom immigration reform is a threshold issue to win their allegiance. The new political forces that were pivotal in returning President Obama to the White House almost immediately led to key voices in the Republican Party beginning to talk about new approaches to immigration. The Republican Party's increasing support for immigration reform has combined with a growing recognition within the Democratic Party that it must deliver on an urgent issue for millions of its supporters. And with business, faith-based communities, and others turning out in support for a major overhaul of the country's immigration laws to deal with unauthorized immigrants and create new channels for future legal workers, the prospects for action in the 113th Congress appear, at this writing, to be brighter than they have been in more than a decade. Bergeron, Claire. 2013. Going to the Back of the Line. Washington, DC: Migration Policy Institute. Available online. Britz, Emma and Jeanne Batalova. 2013. Frequently Requested Statistics on Immigrants and Immigration in the United States. Migration Information Source, January 2013. Available online. Customs and Border Protection. 2013. U.S. Border Patrol Statistics. Available online. Fix, Michael, ed. 2007. Securing the Future: U.S. Immigrant Integration Policy. Washington, DC: Migration Policy Institute. Gzesh, Susan. 2006. Central Americans and Asylum Policy in the Reagan Era. Migration Information Source, April 2006. Available online. Hoefer, Michael, Nancy Rytina, and Bryan Baker. 2012. Estimates of the Unauthorized Immigrant Population Residing in the United States: January 2011. Washington, DC: Department of Homeland Security, Office of Immigration Statistics. Available online. Immigration and Customs Enforcement. 2013. Removal Statistics. Available online. Ji, Qingqing and Jeanne Batalova. 2012. Temporary Admissions of Nonimmigrants to the United States. Migration Information Source, November 2012. Available online. Office of Immigration Statistics. Various Years. Yearbook of Immigration Statistics. Washington, DC: Department of Homeland Security. Available online. McCabe, Kristen and Doris Meissner. 2010. Immigration and the United States: Recession Affects Flows, Prospects for Reform. Migration Information Source, January 2010. Available online. Meissner, Doris, Deborah W. Meyers, Demetrios G. Papademetriou, and Michael Fix. 2006. Immigration and America's Future: A New Chapter. Washington, DC: Migration Policy Institute. Meissner, Doris, Kerwin, Donald M., Chishti, Muzaffar, and Claire Bergeron. 2013. Immigration Enforcement in the United States: The Rise of a Formidable Machinery. Washington, DC: Migration Policy Institute. Available online. Migration Policy Institute. 2011 American Community Survey and Census Data on the Foreign Born by State. Available online. Migration Policy Institute. U.S. 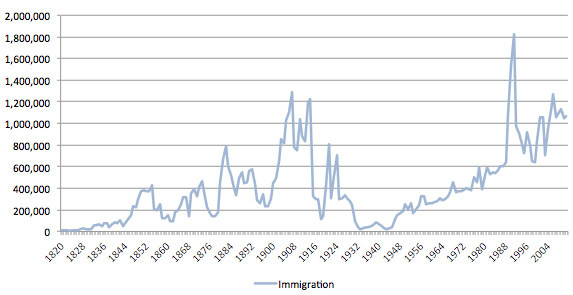 Historical Immigration Trends. Available online. Motel , Seth and Eileen Patten. 2013. Statistical Portrait of the Foreign-Born Population in the United States, 2011. Washington, DC: Pew Hispanic Center. Available online. Passel, Jeffrey, D'Vera Cohn, and Ana Gonzalez-Barrera. 2013. Net Migration from Mexico Falls to Zero-and Perhaps Less. Washington, DC: Pew Hispanic Center Available online. Passel, Jeffrey and D'Vera Cohn. 2012. Unauthorized Immigrants: 11.1 Million in 2011. Washington, DC: Pew Hispanic Center. Available online. Rytina, Nancy. 2012. Estimates of the Legal Permanent Resident Population in 2011. Washington, DC: DHS, Office of Immigration Statistics. Available online. Russell, Joseph and Jeanne Batalova. 2012. Green Card Holders and Legal Immigration to the United States. Migration Information Source, October 2012. Available online. Russell, Joseph and Jeanne Batalova. 2012. Refugees and Asylees in the United States. Available online.